Our Flexible Flyer Ice Scraper is great for scraping ice and frost off your car windows. The 4" blade does a very thorough job without scratching your windows. It has a foam air grip handle for comfort. It is very compact to store in your vehicle, which means you'll always have it when you need it! This ice scraper has the added benefit of being low cost! It is lightweight, yet made to last! 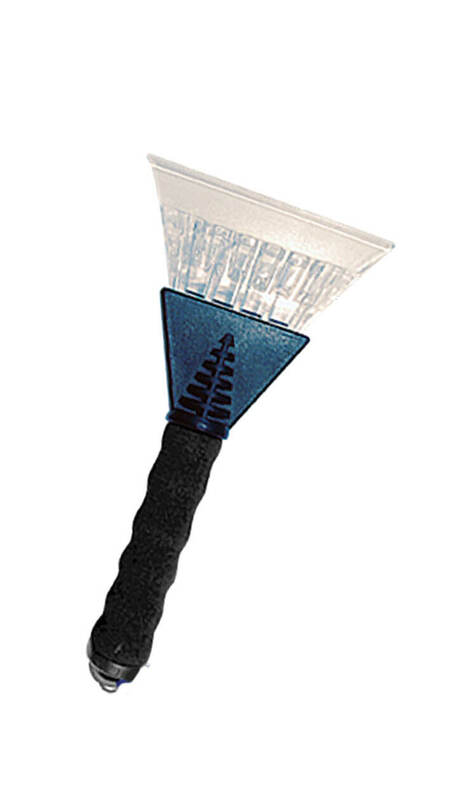 Our Flexible Flyer Ice Scraper is great for scraping ice and frost off your car windows. The 5" blade does a very thorough job without scratching your windows. It has a foam handle for comfort. It is very compact to store in your vehicle, which means you'll always have it when you need it! This ice scraper has the added benefit of being low cost! It is lightweight, yet made to last! 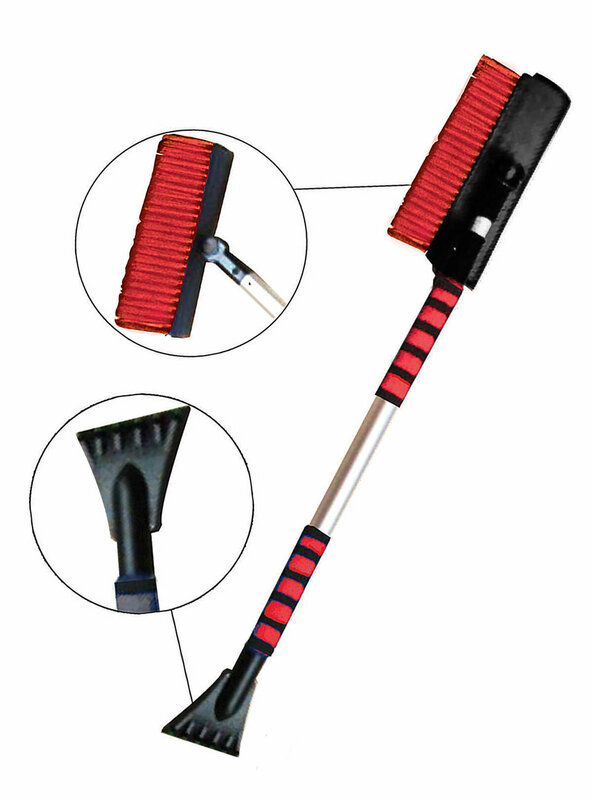 Our 22" Flexible Flyer Snowbrush has a durable construction for handling snow removal. 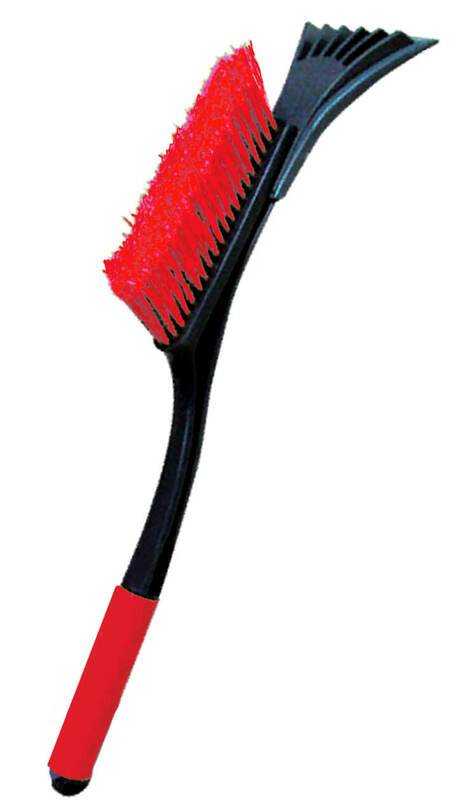 The bristles are sturdy for heavy duty jobs. It has a scraper to remove frost and ice from car windows easily. The size is perfect to allow you to reach across the windshield, yet it's compact enough for convenient storage in your vehicle. It features a foam hand-fit grip for comfort which makes it easy to use. Our Pivoting Extender Snowbroom features a large pivoting 11" snowbrush and rubber squeegee head. The head is adjustable in 4 position lengths from 32" to 49". The quick press design makes adjustments to different lengths quick and easy. Also, the brush can rotate to get the best angle. The Dual foam grips provide comfort and maximum control. This size is great for large trucks and SUV's. You can count on this snowbroom even in the heaviest of snowstorms! Adjusts to 4 position lengths from 32" to 49"
Our Ice Scraper Mitt has a water-resistant outer layer with a soft, thickly insulated fleece liner. The comfortable ice scraper handle is inside so your hand stays warm and dry while scraping ice and snow from your vehicle windows. The elastic wristband prevents ice and snow from getting in the mitt. It is very compact to store in your vehicle, which means you'll always have it when you need it! This good-looking and effective Ice Scraper Mitt makes a great gift! Our 23" Sweep Snowbrush is a heavy-duty snowbrush that quickly brushes away the snow. The size is perfect for reaching across the windshield. The foam grip is comfortable to use. It has a 4" scraper for effectively scraping frost and ice from car windows. It is lightweight and small enough to conveniently fit in your vehicle for easy access when needed. Our Pivoting Extender Snowbroom features a large pivoting 10.5" snowbrush and rubber squeegee head. The head is adjustable in 4 position lengths from 35” to 50”. The quick press design makes adjustments to different lengths quick and easy. Also, the brush pivots with the press of a button so you can choose the best angle. This is a great size for large trucks and SUV's. You can count on this snowbroom even in the heaviest of snowstorms. Our Super Light Snowbrush quickly brushes away the snow with it's 9" brush. It also has a 4" scraper for effectively scraping frost and ice from the windows on your vehicle without scratching them. The aluminum shaft makes it both lightweight and durable which is a nice feature! The ribbed foam grip is comfortable and provides added control. This item makes a great gift!